Apium graveolens is used around the world as a vegetable, either for the crisp petiole (leaf stalk) or the fleshy taproot. In temperate countries, celery is also grown for its seeds. Actually very small fruit, these “seeds” yield a valuable volatile oil used in the perfume and pharmaceutical industries. They also contain an organic compound called apiol. Celery seeds can be used as flavouring or spice, either as whole seeds or ground and mixed with salt, as celery salt. Celery salt can also be made from an extract of the roots. Celery salt is used as a seasoning, in cocktails (notably to enhance the flavour of Bloody Mary cocktails), on the Chicago-style hot dog, and in Old Bay Seasoning. Celery, onions, and bell peppers are the holy trinity of Louisiana Creole and Cajun cuisine. Celery, onions, and carrots make up the French mirepoix, often used as a base for sauces and soups. Celery is a staple in many soups, such as chicken noodle soup. Celery is an important ingredient in Indian cuisines including in Indian Curry. Celery is widely eaten by guinea pigs, dogs, horses, birds, squirrels, and small rodents. Celery is valuable in weight-loss diets, where it provides low-calorie dietary fiber bulk. Celery contains androstenone. Bergapten in the seeds can increase photosensitivity, so the use of essential oil externally in bright sunshine should be avoided. The oil and large doses of seeds should be avoided during pregnancy: they can act as a uterine stimulant. Seeds intended for cultivation are not suitable for eating as they are often treated with fungicides. There is a common belief that celery is so difficult for humans to digest, that it has negative calories because human digestion burns more calories than can be extracted. Celery seeds are also a great source of calcium, and are regarded as a good alternative to animal products. Celery is amongst a small group of foods (headed by peanuts) that appear to provoke the most severe allergic reactions; for people with celery allergy, exposure can cause potentially fatal anaphylactic shock. The allergen does not appear to be destroyed at cooking temperatures. Celery root—commonly eaten as celeriac, or put into drinks—is known to contain more allergen than the stalk. Seeds contain the highest levels of allergen content. Exercise-induced anaphylaxis may be exacerbated. An allergic reaction also may be triggered by eating foods that have been processed with machines that have previously processed celery, making avoiding such foods difficult. In contrast with peanut allergy being most prevalent in the US, celery allergy is most prevalent in Central Europe. In the European Union, foods that contain or may contain celery, even in trace amounts, have to be clearly marked as such. Well till now I haven’t used celery too much in my dishes, but will update soon. What is the name of celery in URDU or Hindi Plz answer this. 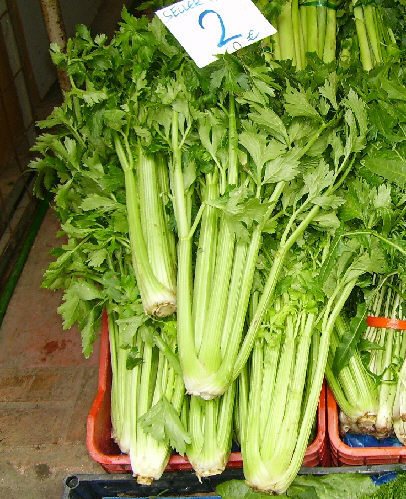 What is the name of celery in BANGLA.Looking for your answer. What is the exact meaning of celery in hindi? It is called celery everywhere I guess…..